Summary: More than anything, Joel wants to be a Rithmatist. Chosen by the Master in a mysterious inception ceremony, Rithmatists have the power to infuse life into two-dimensional figures known as Chalklings. Rithmatists are humanity’s only defense against the Wild Chalklings — merciless creatures that leave mangled corpses in their wake. Having nearly overrun the territory of Nebrask, the Wild Chalklings now threaten all of the American Isles. Review: Brandon Sanderson is known for his world building, and he does not disappoint in his first YA novel! Sanderson is a master of pacing, so don’t be worried about getting overwhelmed in this world he has created. 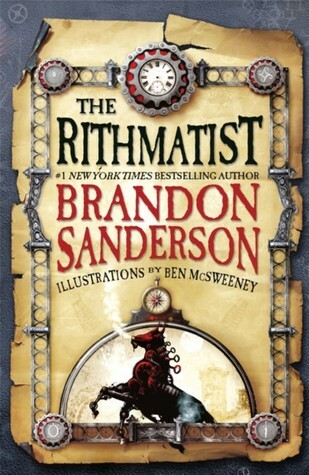 Sanderson slowly introduces readers to the world of Rithmatists, Rithamtics, and Chalklings. It’s a fun ride, with a murder-mystery intertwined as well! Sanderson has added steampunk elements to the twenty-first century, along with a sort of magic. Rithmatists are able to draw–with chalk–cirlces, lines, and pictures that come to life. Wild chalkings are those chalk creatures that are untamed and are wreaking havoc on the United Isles. Oh yeah, Sanderson splits the States into Isles! Joel, a non-Rithmatist, is obsessed with Rithmatics and finds himself in the center of a murder-mystery invovling Rithmatist students from his school. Melody, a Rithmatist who’d rather being drawing unicorns, also finds herself in the center of things, alongside Joel. This is the first novel in a new series, so the pacing is nice and slow. However, the tension is kept high with the disappearance of students and new teacher who stirs the campus into a frenzy.